ORLANDO – Painful spasms and tightness that knocked Orlando Magic forward Aaron Gordon out of the final nine minutes of Friday’s narrow loss to the Brooklyn Nets did the same thing on Saturday and prevented the defensive standout from facing Milwaukee Bucks’ superstar Giannis Antetokounmpo. Gordon tried playing in pain and drilled a 3-pointer with 10:36 to go in the game that put the Magic ahead 100-89. However, he soon after checked out of the game and retreated to the Magic locker room where he watched the Nets and standout guard D’Angelo Russell (40 points and eight 3-pointer) rally for a 117-115 win over Orlando. For Gordon, who had 23 points and three 3-pointers on nine-of-13 shooting, it was a helpless feeling having to sit and watch his teammates struggle. Also, it was an eerily familiar feeling to what he experienced on Nov. 26 when Golden State and Kevin Durant (49 points) wiped out an 18-point deficit and rallied to beat the Magic after Gordon departed with low-back pain. 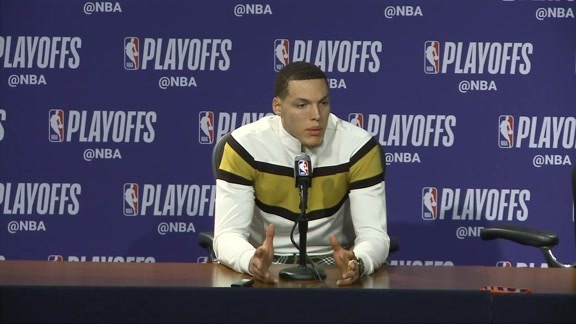 Magic coach Steve Clifford, who started Jonathon Simmons on Saturday so as to not bother the team’s bench rotation, said that Gordon made progress on Saturday – just not enough to be able to play. The team is hopeful that Gordon – the team’s second-leading scorer (15.8) and second-leading rebounder (7.6) – will be able to play by Monday’s 3 p.m. game in Atlanta. When Gordon was injured in the loss to Golden State on Nov. 26, he missed the subsequent game two nights later in Portland. He made his return on Nov. 30 in Phoenix – four nights later. HOLDING LEADS: Friday’s game offered up another instance where the Magic played well in the early going, struggled holding a big lead and ultimately lost a game that they felt they should have won. After falling behind 2-0, the Magic didn’t trail again until the final minute when Russell buried a step-back 3-point shot. In between, the Magic led by seven points after one period and by as much as 21 points midway through the second quarter. Even after repeated charges by Brooklyn, the Magic seemed to steady themselves and led by 11 with more than 10 minutes to play and by eight with 4:50 to play. However, when the Magic went cold down the stretch and the Nets kept drilling 3-pointers, paving the way for another loss in which the Magic had a sizeable lead. Prior to Saturday’s game, the Magic have lost two games in which they led by 20-or-more points, seven games in which they led by at least 15 points and 13 games in which they had a double-digit lead. On the positive side, they are 14-5 when leading after three periods and they’ve rallied for four wins when starting the fourth quarter behind. Clifford pointed out that 20-point leads aren’t as safe as they once were because of the way teams in the NBA now take and make 3-point shots in gobs. Another, below the radar factor in comebacks, is the NBA’s new rule of resetting the shot clock to 14 instead of 24 when the offensive team rebounds a miss. That has brought on more possessions and it doesn’t allow teams in the lead to run out the clock quite as easily. Undoubtedly, Orlando’s struggles to find a consistent second unit behind its starters have also played into the its inability to hold some of their leads that it has built. BACK-TO-BACK BLUES: As players and coaches know quite well, not all back-to-back sets of games are created equally. 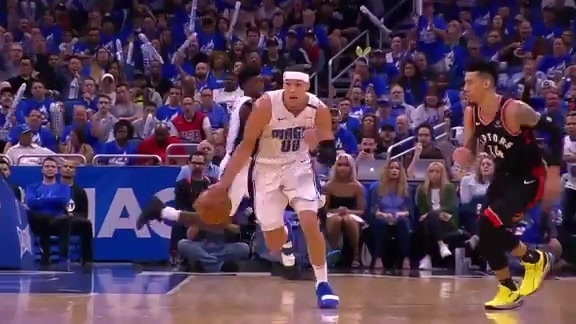 On Saturday, the Magic were playing their 10th back-to-back set of games and for the third time it was a back-to-back where they had home games on consecutive nights, allowing them to avoid travelling in between games. The Magic swept the previous two home/home back-to-backs, beating the Lakers and Knicks on Nov. 17-18 and the Celtics and Rockets on Jan. 12-13. What made this back-to-back unique for the Magic – and not necessarily in a good way – was the fact that the Bucks had such a decisive rest advantage. After whipping the Grizzlies in Memphis on Wednesday, Milwaukee arrived in Orlando in the early-morning hours of Thursday and had two days of rest. Meanwhile, the Magic were back on the Amway Center parquet Saturday night less than 24 hours after losing a hard-fought, down-to-the-wire game on Friday. Coming into Saturday, the Magic were 7-3 on the first night of back-to-back sets, but just 2-6 prior to facing the Bucks. Several factors play into that, Clifford said, such as one team having far more rest than the other – such as Milwaukee on Saturday. UP NEXT: The Magic’s off day on Sunday will involve them travelling to Atlanta where they will face the Hawks on Monday afternoon. The game will feature a special 3 p.m. tip-time in honor of the Martin Luther King Jr. holiday. Also, Monday’s game will be televised nationally by NBA TV, in addition to being televised locally by Fox Sports Florida.